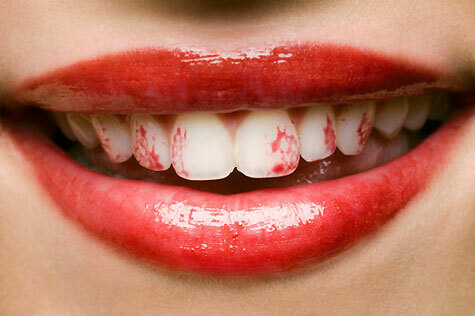 Lipstick on teeth:- This is especially bad when it’s an intense colour like red. It just looks so tacky and is one of the major reasons I avoided wearing lipstick for so long. Mascara on eyelids:- I know that sometimes you can’t avoid getting mascara on your eyelids (it’s happened to me on many occasions) but I hate when people don’t make the effort to clean it up! It looks really messy and it makes people focus on your eyes for the wrong reason. I knew someone who did this all the time and I swear it seemed like she was just applying her mascara straight to her lids on purpose! I always had to fight the urge to grab a tissue and wipe it off. Spidery lashes:- I know thick lashes look great but when each of your individual lashes looks like it’s growing lashes of its own it probably means it’s time to drop the mascara! I always think 2 coats of mascara is more than enough for most people. Overly highlighted skin:- I love a good highlighting and illuminating product as much as the next girl but there is definitely such a thing as too much highlighting! I was reminded of this when I was watching Burlesque for the first time the other day and saw that Christina’s makeup artist had gotten a little too carried away with highlighting her cheekbones. Less is definitely more in this case! Badly applied foundation:- There is no greater pet peeve for me than when I see women (or men) who wear their foundation like a mask and don’t blend their makeup down their neck or into their hairline. It just looks so unnatural! Am I alone here and being unnecessarily harsh or does badly applied makeup drive you insane too? I’m genuinely curious about what other people’s makeup pet peeves are so please let me know below if you have some of your own! Mine is the wrong shade of foundation plus darker lipliner with a lighter lipcolour – SO common in India and so, there's no other word for it, DISGUSTING. Ki: Lol those are good ones 😀 I forgot about them but I completely agree! Even though the 90's were so long ago the dark lipliner/light lipstick thing still won't die. The wrong foundation shade is such a turn off as well! Super duper winged out eyeliner is SO. NOT. OK. If your eyeliner is winged out to your ear, it's no bueno.Putting concealer under eyes and not blending it enough is quite terrible as well. hahahah I'm just constantly asking people 'do I have lipstick on my teeth or all over my face?' haha I have no shame. I personally don't like really heavy false lashes. The ones that look like they're kind of one big piece of plastic. I don't get that look. And 80% of the time it's accompanied by frosty pink lipstick and tons of shimmer. I used to have a boss who always had lipstick on her teeth. I just couldn't take her seriously. TOO MUCH BLUSH! I hate when the blush is SOO obvious and not blended out at all, it looks awful. Heather: Agreed! Whether it's not blended enough, too bright or just in the wrong spot, badly applied blush is so awful! What about TOO MUCH BLUSH. People using the wrong shade of blush with their skin tone.OVERLY BRONZED SKIN.Oh my god, I could go on forever. AdmiralBiatch: Lol there are so many more things that can be added to the list! Love your user name btw!